Russian General reveals Western Conspiracy and warns America and the World of Dire Consequences! With these words, Colonel-General Rudskoy, the head of the Main Headquarters of the General Staff of the Russian Federation (the Main Operations Directorate of the General Staff) turned to all beloved and deeply respected America. "Even earlier, a few days ago, Valery Gerasimov, the chief of the Russian General Staff, made an open statement to all the world's media. In his address, Comrade Gerasimov said that Russia is aware of the impending sabotage in the Eastern Guta region. The opposition, controlled by a coalition led by the United States, is preparing to use the world's banned chemical weapons. We told you that we are aware of the facts that "actors" and equipment were already brought into the alleged attack area, with the help of which the whole world was later to see a film about how the troops of the government of Syria, that is, the army of Assad, violate the world legislation and applies chemical weapons against civilians. First. All that humanitarian aid of the Western coalition, which was supposed for civilians of East Hut, suffering from terrorists, was directly at the disposal of these same terrorists. Not only that the Western coalition provided the militants with everything necessary, so it also contributed to their ranks being replenished. How? It's simple. Terrorists give the civilians food, in exchange for their assistance. The second. We have data that are not doubted that fifty kilometers from the US military base (near the town of At-Tanf), American specialists are training specially formed groups of terrorists whose mission is to conduct provocative actions using banned chemical weapons in the southern part of the country. Earlier this month, these militant detachments were sent to the area of ​​the settlement of Deraa, which is under the control of the "Free Army of Syria". And now, these units are directly preparing to commit provocations, preparing explosives with poisonous chemicals. The plan is also clear: after a series of such explosions, charges will be brought against government troops. Thus, the US is trying to "untie one's own hands," to launch aggressive actions against the Assad regime. We absolutely know that everything necessary for the manufacture of poisonous shells has already been brought to the southern part of de-escalation. By the way, all imported (materials were) disguised as humanitarian aid to private American companies. Also, the militants were provided with fuses, which were brought under the guise of tobacco. At the disposal of terrorists there are twenty containers with a substance like chlorine, which will be used in alleged provocative attacks. All the preparatory measures are thoroughly masked, and the consequences of the attacks are planned to be widely publicized. The main purpose of these provocations is to strike a large-scale strike by the US Army through the territory of Syria, in particular on government and state facilities. We are also aware of the stages of preparation for this blow. In several sea squares, the United States creates an enhanced grouping, which is armed with cruise missiles. 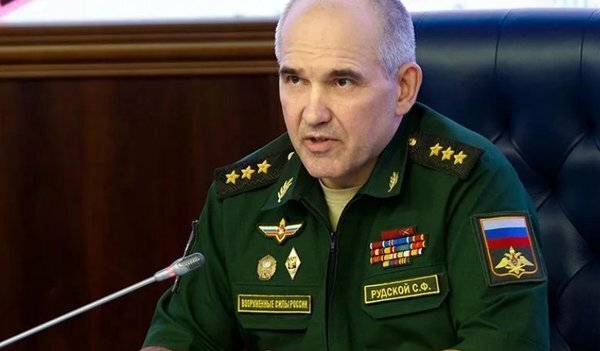 So, in connection with all of the above, we consider it our duty to inform you that the Russian General Staff is very closely monitoring all changes in the situation concerning Syria. We are also obliged to warn that if, on the west side, a blow to Damascus is struck, in the government quarters, among which are servicemen of the Russian army. And not only servicemen, but also diplomatic employees, advisers, military police and the Center for Conciliation of the parties. So, if this blow is, in this case, the Russian side will strike back not only on the missiles themselves, which will not have time to reach the target, but also on the square from where these missiles will be launched. On Saturday, the Hal Turner Radio Show web site outlined sudden and dramatic events which led Russia to conclude the U.S. is planning a major attack upon Syria. That time line of events appears HERE. Late Sunday, the Hal Turner Radio Show web site outlined the bolstering of US Navy forces by 13 surface vessels and six submarines of NATO countries, which were just finishing exercises. The events on Saturday and Sunday, as well as today's speech by General Rudskoy has not been mentioned EVEN ONCE by the regular mass-media in the United States or in Europe. Citizens of the West of blissfully unaware of just how close we are to the physical breakout of World War 3. It is not surprise that the media is silent; they do the bidding of certain elements of government; the same elements now getting us farther into troubles in places we don't belong. If the American people started hearing about this on regular mass-media, there would be a public outcry to put a halt to it. The elements within government perpetrating these shenanigans do not want the public to know, in order to prevent that public outcry. They want the eruption of war to be sudden and FRIGHTENING, so citizens will be scared, and will quietly fall-in-line and do what government tells them. The Western World has gone completely MAD. And the war-mongering May is prepared to kill thousands and destroy yet more infrastucture on the coat tails of a corrupt US regime and on the back of fraudulent false flag chemical attacks. A direct confrontation with Russia doesn't bear thinking about. What has Britain come to? What will it come to if NUCLEAR weapons start to fly?